That’s only two options, specifically related to Products. We could quite easily just append them onto the core WooCommerce Products Settings (WooCommerce > Settings > Products), but that wouldn’t be very user friendly. Users wouldn’t know where to look initially so they’d have to scan all of the Products options and it would be difficult / impossible to link the options directly. Fortunately, as of WooCommerce 2.2.2, there is a new filter in place that allows you add a new section, beneath one of the core settings’ tabs. We’ll go over doing this through individual functions, but you should probably create a Class that stores all of your settings methods. Make sure you change the wcslider parts to suit your extension’s name / text-domain. The important thing about the woocommerce_get_sections_products filter, is that the last part products, is the tab you’d like to add a section to. So if you want to add a new tab to accounts section, you would hook into the woocommerce_get_sections_accounts filter. Now that you’ve got the tab, you need to filter the output of woocommerce_get_sections_products (or similar). You would add the settings like usual using the WooCommerce Settings API, but check for the current section before adding the settings to the tab’s settings array. 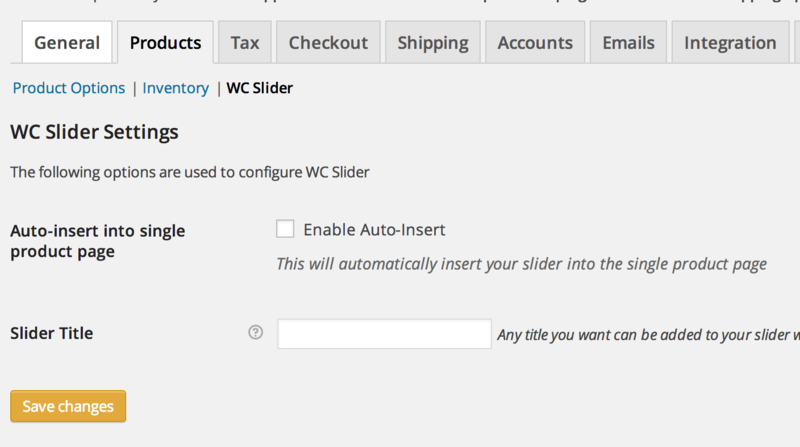 We’re hooking into the same woocommerce_get_sections_products filter, but this time doing a check that the $current_section matches our earlier defined custom section (wcslider), before adding in our new settings. You would now just use your newly created settings like you would any other WordPress / WooCommerce setting, through the get_option function and the defined ID of the setting. When creating an extension for WooCommerce, think about where your settings belong before you create them. The key to building a useful product is making it easy to use for the end user, so appropriate setting placement is crucially important. For more specific information on adding settings to WooCommerce, check out the Settings API documentation.